Cereal is one of the best choices that you can make for breakfast. As you may already know, breakfast is the most important meal of the day. If this be the case, it ought to be a healthy breakfast. 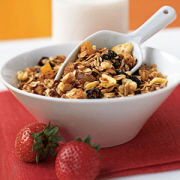 The best and healthiest types of cereals are those that are made from whole grain. When something is said to be whole grain it has not been refined and the bran, endosperm and germ are still present. The bran is the part of the grain that contains fiber, B Vitamins and trace minerals. The endosperm is the part of the grain that contains the carbohydrates and Proteins. And finally, the germ is the part of the grain that has most of the nutrients including antioxidants, B vitamins and Vitamin E.
Reducing the risk of colon cancer and stomach cancer. These days most ready-to-eat, more so whole grain ,cereals are beneficial because they are nutrient dense. When a food is said to be nutrient dense it means it is nutritionally loaded as compared to the calories it has. In other words, few calories for great nutritional benefits. Because of this, nutrient dense foods keep you satiated for longer, which in its own way helps with weight management. Other common examples of nutrient dense foods are fruits and vegetables. Most people enjoy adding fresh or dried fruit to their cereal, some of the cereals come with dried fruit in it already . When this happens, one can only imagine how much good you will be doing to your body, in terms of health! With simple things like this, eating healthy should not be so difficult to do. So how do you choose a healthy cereal? Look at the cereal nutrition facts on the box. Choose whole grain cereals. You will know that it is a cereal made from whole grain if 'whole grain' is the first or one of the first ingredients on the box. Or if the word 'whole' precedes a grain, for instance, whole wheat. If it does not say 'whole grain' then it's not. Don't be fooled by a 'brown' color of the cereal, it could just be coloring. If whole grain is present, the next thing to check would be the sugar and salt content. Make sure these are not present in high quantities. Also, avoid cereals with partially hydrogenated oils, trans fats or made with refined grains and have added sugar. For those who may want to lose weight, too much sugar is not particularly helpful. We will now take a look at some different types of cereal nutrition facts. You will notice from the ingredients that most of the cereals from General Mills have are made from whole grains, this is definitely a good thing. The percent daily values (DV) are based on a 2,000 calorie diet. Your values may be higher or lower depending on your daily calorie needs. 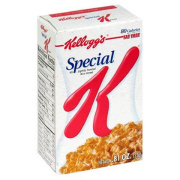 When we look at the Special K cereal nutrition facts we see that the amount of sodium and calories are moderate to high. On the positive side, it does not contain a lot of sugar and is a source of Protein, Dietary Fiber, Vitamin A, Vitamin C, Calcium and Iron. One half cup of fat free milk contributes an additional 40 calories, 65mg sodium, 6g total carbohydrates (6g sugars), 4g protein, 5% Magnesium, Vitamin A and Thiamin, 10% Phosphorus, Riboflavin, 15% of Vitamin D and 13% Calcium. 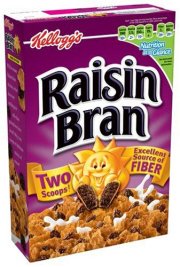 Kellogg's Raisin Bran cereal nutrition facts reveal that it is fair in terms of its total fat, saturated fat and sodium content. It is a source of Potassium, Calcium and Protein. It is also a good source of Vitamin A, Vitamin D, Riboflavin and Phosphorus. In addition to this, Raisin Nut Bran is a very good source of Dietary Fiber, Thiamin, Niacin, Vitamin B6, Folic Acid, Vitamin B12 and Zinc. 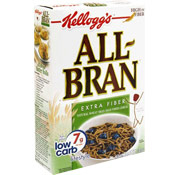 When fat free skim milk is added to this Kellogg's All Bran cereal with extra fiber, 40 more calories are added, 65mg sodium, 6g total carbohydrates (6g sugars), 4g Protein, 5% Zinc, Vitamin A, Thiamin and Magnesium, 10% Phosphorus, Vitamin B12 and Riboflavin and 15% more of Calcium, Vitamin D. All else remains the same. Nutrition facts on Kellogg's All Bran cereal reveal that it's low to moderate in terms of calories and low in total fat, sodium and does not contain any saturated fat. which is good. It is a source of Protein and a good source of Dietary Fiber, Vitamins A, C and D, Calcium, Iron, Thiamin, Riboflavin, Niacin, Magnesium, Zinc and Copper. Above this, All Bran is an excellent source of Phosphorus, Vitamins B6 and B12 as well as Folic Acid with the last three being provided in 100% of your recommended daily value of the nutrients. Ingredients: Soy Grits, Kashi Seven Whole Grains and Sesame (this is a mix of Hard Red Wheat, Brown Rice, Whole Grain Oats, Triticale, Barley, Rye, Buckwheat and Sesame Seeds), Evaporated Cane Juice Syrup, Corn Meal, Corn Flour, Soy Protein, Wheat Bran, Oat Fiber, Corn Bran, Honey, Evaporated Cane Juice, Natural Flavors, Calcium Carbonate, Salt and Annattto Color. This cereal also contains Soybean and Wheat. 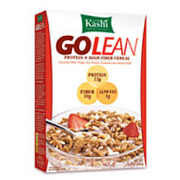 Kashi Go lean nutrition facts provide us with important information. We can see that it is a good source of Dietary Fiber, Protein, Iron, Phosphorus and Potassium. Another good thing about this cereal is that it does not contain a lot of sugar. This is a table that shows in comparison the nutrition facts that are in cereal bars. The percentages in the table are the percent daily values (DV) based on a 2,000 calorie diet. Ingredients include: Whole Grain Wheat, Corn Bran, Modified Wheat Starch, Guar Gum, Color Added, Cellulose Gum, Salt, Baking Soda, Corn Oil and Aspartame. 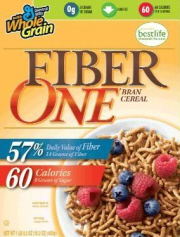 Fiber One cereal nutrition facts show that it is low in calories, total fat and sodium. It does not contain any saturated fat or cholesterol. It is a good source of Vitamin C, Calcium, Iron, Thiamin, Riboflavin, Niacin, Vitamin B6, Folic Acid, Vitamin B12 and Zinc. As its name suggests, Fiber One is an excellent source of Dietary Fiber. It provides you with 57% of your recommended daily value (DV) of the nutrient. Ingredients include: Whole Grain Wheat, Sugar, Corn Syrup, Salt, Monoglycerides, Annatto Extract Color. BHT Added to Preserve Freshness. When half a cup of skim milk is added, the following increases are found; 40 calories, 3% Sodium, 5% Potassium and Vitamin A, 10% Calcium, Riboflavin and Vitamin B12, 15% Vitamin D, 12% Phosphorus, 4% Magnesium. 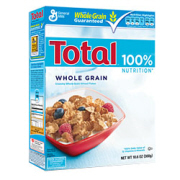 Total Whole grain cereal nutrition facts give us an insight to the nutritional value of the cereal. Also as its name suggests, it provides the total (100%) recommended daily value of a number of minerals, nutrients and vitamins. These include Vitamin C, Calcium, Iron, Vitamin E, Thiamin, Riboflavin, Niacin, Vitamin B6, Folic Acid, Vitamin B12, Pantothenic Acid and Zinc. Now this is one nutritionally loaded cereal! Ingredients: Whole Grain Wheat, Sugar, Raisins, Almonds, Corn Syrup, Brown Sugar Syrup, Partially Hydrogenated Cottonseed and or Soybean Oil, Salt, Glycerin, Almond Meal, Natural and Artificial Flavor, Trisodium Phosphate, BHT Added to Preserve Freshness. 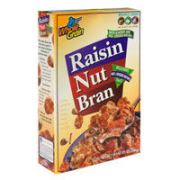 Adding skim milk to this cereal will add 5% to Zinc and Thiamin, 10% Phosphorus, Vitamin B12, Riboflavin and Vitamin D, 13% to Calcium and 4% Vitamin A.
Raisin nut bran cereal nutrition facts reveal that it is a very good source of a number of minerals, vitamins and nutrients. 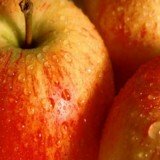 These are Dietary Fiber, , Iron, Thiamin, Riboflavin, Niacin, Vitamin B6, Folic Acid, Vitamin B12 and Zinc. You receive 25% of your recommended daily value of all these nutrients, save for Dietary Fiber which is 20% of your DV. The ingredients include: Whole Grain Corn, Corn Meal, SUgar, Corn Bran, Salt, Brown Sugar, Syrup, Trisodium Phosphate, Vitamin E Added to Preserve Freshness. 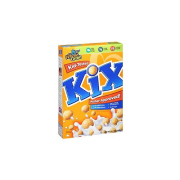 Kix cereal, according to its nutrition facts is a good source of Dietary Fiber, Vitamin A, Vitamin C, Calcium, Vitamin D, Thiamin, Riboflavin, Niacin, Vitamin B6, Vitamin B12 and Manganese. In addition to this it is an excellent source of Iron and Folate. Providing 45% and 50% respectively of your recommended daily value of the mineral and nutrient. Ingredients for Quaker's Life cereal include: Whole Grain Oat Flour, Sugar, Corn Flour, Whole Wheat Flour, Salt, Calcium Carbonate, Disodium Phosphate, Reduced Iron, Zinc Oxide, BHT (AS A PRESERVATIVE), Yellow 5, Yellow 6 and the following B Vitamins; Niacinamide, Thiamin Mononitrate, Pyridoxine Hydrocholride, Riboflavin and Folic Acid. 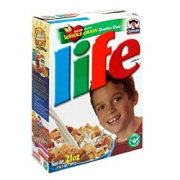 Life cereal nutrition facts show that it's a good source of Calcium, Thiamin, Riboflavin, Niacin, Vitamin B6, Phosphorus and Zinc. Like Kix Cereal, Quaker's Life cereal is also an excellent source of Iron and Folic Acid, providing 45% and 60% respectively of the two. This table includes the cereal nutrition facts of the various cereals covered in this article as well as for Kellogg's Vector and Food for Life's Ezekiel 4:9 cereal. This is a table of the vitamins A and C, Calcium and Iron content of the cereals in the above table. Once again, the percent daily values are based on a 2,000 calorie diet. The Recommended Cereals contain little or no added sugars and are made with mostly whole Grains. All Bran or High Bran Cereals also qualify to be in this category.The less recommended cereals are made from refined grains and contain a lot of added sugar. Here's to you making healthy cereal choices!